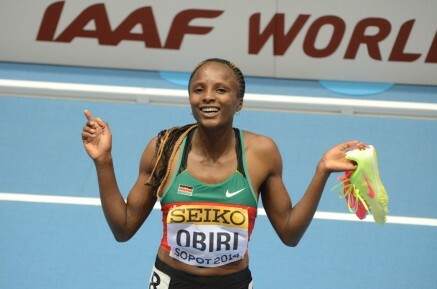 27th April 2014 – World Indoor 3000m silver medalist Hellen Obiri (KEN) made the perfect start to her outdoor campaign at the Drake Relays in Des Moines. Racing over 1500m Obiri followed the slow early pace which saw the leaders go through 800m in 2:16 and then led the field when the pacemaker dropped out at 1000m. Staying relaxed through the bell Obiri kicked hard with 300m to go and continued to move away from the field over the final 200m crossing the line 4:04.88, a World Lead for 2014. Shannon Rowbury (USA) also finished strongly to take 4th in 4:07.83. Also in the US, Andy Turner (GBR) took a break from training to make his 2014 outdoor debut at the Clermont meet. Turner was pleased with his performance taking 2nd place in 13.47, his fastest time for 2 years.